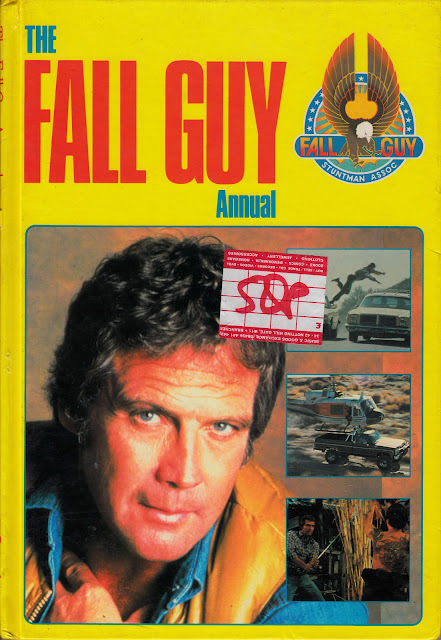 When I was little, I loved Glen Larson's THE FALL GUY (1981-86) although I never owned a copy of this British annual, published (I'd guess) around 1982. I stumbled across a copy far more recently at a price - as you'll see - that I found hard to resist. Over the past decade-or-so, I've occasionally dabbled with the odd episode of the show and I was pleasantly surprised to find that it's by no means terrible. It's actually a fun little romp with a welcome sense of humour, albeit one that demands almost zero brain-engagement. And the stunts, which seemed so spectacular at the time, are painfully exposed as usual TV fare or (ironically) clipped wholesale from feature films. And Colt's truck - such an integral part of the viewing experience thirty years ago - is cruelly exposed as being the product of an awful lot of utterly unconvincing studio-bound back projection (DUKES OF HAZZARD: I'm also looking at you with more critical eyes!). The feature-length pilot not only boasts superior-to-the-series production standards but also a rare chance to hear the full version of the legendary theme (The Unknown Stuntman), as crooned by star Lee Majors (and - apparently - a key part of Larson's successful pitch to sell the show to the network). But the standout scene comes right at the end: a publicity-generating cameo by Lee's ex, the ever-lovely (and much-missed) Farrah Fawcett. It's brief, but laden with double-meaning and repressed emotion. I think - and I know nothing of any behind-the-scenes shenanigans - she was a bloody good sport to do it. Season three opened with another pairing with a lovely lady from Major's past: Lindsay (Bionic Woman) Wagner in Devil's Island. The chemistry between the two is unmistakable. The 1984 (season four) and 1985 (season five) Halloween-themed episodes, October the 31st and (predictably) October the 32nd, both guest-star Elvira (who - amusingly - has the hots for Colt) along with - respectively - David Carradine (actually a bevy of Carradines) and Doug McClure. They're great fun and should become part of anyone Halloween season tradition.